“333” was formed in 2009. Neither suspected that from their humble beginnings and friendly jams that their project would so rapidly bear fruit but it was soon evident that there was potential for viable and productive writing within their collaboration. 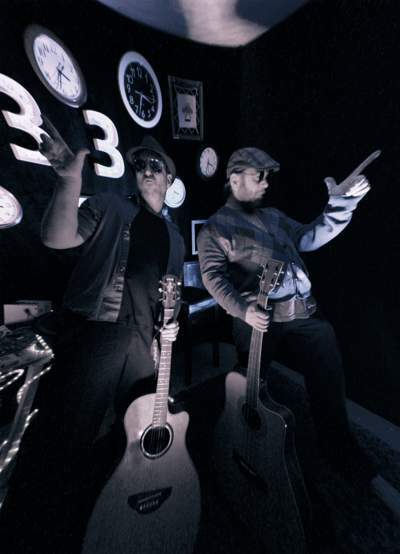 Working with crude equipment like small handheld recorders, the duo would begin to hone and craft an accessible and ambitious mix of rock, jazz, funk, world and pop music blended with a spiritual and positive message carried by the lyrics. Busy melodic bass lines play harmonically against always rhythmic and occasionally sparse guitar work to create lush musical soundscapes under pop-edged vocals. The incorporation of non-linear rhythms and unconventional world music elements like Burundi drums and tablas lend an added dimension of industrial and electronica to the overall sound. The sound of 333’s music can be compared to many popular rock acts of the past 50 years. Some of the more obvious parallels drawn have been: The Beatles, Lenny Kravitz, CAKE, Cream, The Black Crowes, Led Zeppelin, The Rolling Stones, Radiohead, The Black Keys, and The Raconteurs just to name a few. 333’s music doesn’t preach, but it does promote positive and healthy means of interacting with the world outside of oneself and a spiritual, non-religious thread that binds us all as people. It tries to transcend man-made boundaries and appeal to the humanity in us all. While it may not be everyone’s cup of tea, it does walk a line between different genres of music in an attempt to bring people together.